"Like many people, I enjoy iced coffee at any time of the year. It is just one of those things that never seems to get old. But who wants to go pay 5 dollars every day and wait another 5 to 10 minutes to get it made for them? Haha, not many. 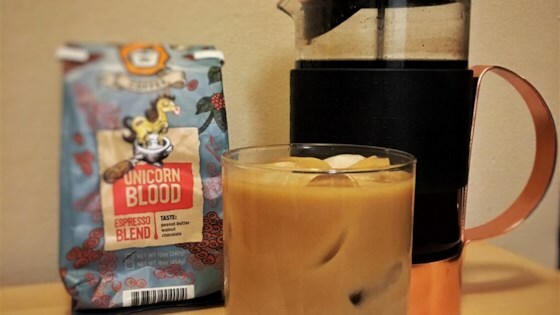 My goal was to find a super cheap and easy way to make cold-brewed coffee that tasted just like Starbucks®, and boy did I hit the nail on the head for this one. Here is an easy, homemade way to remake your favorite drink for a price anyone can afford!" Combine water and ground coffee in a French press; stir to ensure coffee is evenly mixed with water. Push the plunger halfway down slowly. Let coffee steep at room temperature for 20 to 24 hours. Mix milk and sugar in a pitcher until sugar is dissolved. Push French press plunger all way the down; pour coffee over the cream. Divide coffee mixture among 4 glasses; top with ice. If I could recommend something, I would suggest that regular ice cubes are going to dilute the coffee. This is better if your ice is itself made of coffee. It turned out very delicious. Will make it again for sure.